Tom Brady Calls NFL's 4-Game Suspension 'Unfair' : The Two-Way The Patriots quarterback said he got rid of his phone only after his lawyers told the NFL his device would "not be subjected to investigation." Brady said he was "disappointed" in the NFL's decision. 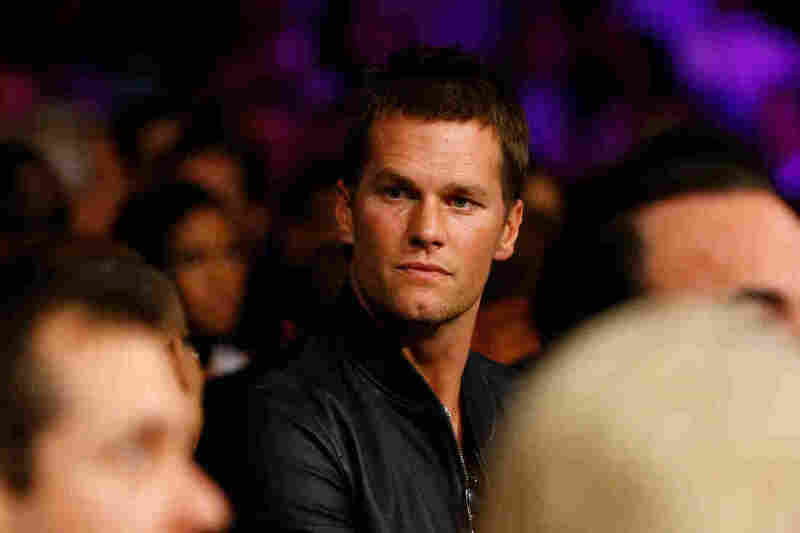 NFL quarterback Tom Brady attends the welterweight unification championship bout on May 2 at the MGM Grand Garden Arena in Las Vegas. Tom Brady issued an impassioned defense of his actions this morning after NFL Commissioner Roger Goodell decided to uphold a four-game suspension over his role in "deflategate." The New England Patriots quarterback called the suspension "unfair" and said he was "disappointed" that Goodell dismissed his "hours of testimony." The bottom line, Brady said: "I did nothing wrong, and no one in the Patriots organization did either." That was, of course, not the conclusion Goodell came to, and it was not the conclusion that attorney Ted Wells came to after a significant investigation. "The Wells Report identified two Patriots employees — equipment assistant John Jastremski and officials locker room attendant Jim McNally — as playing pivotal roles in deflating footballs to make them easier to grip. "Transcripts of messages between the two workers referred to Brady by name, and spoke of both meeting with and receiving gifts from him." In his decision Tuesday, Goodell specifically said that he found Brady was aware of and supported the deflation of footballs. Not only that, Goodell said, but Brady also tried to get rid of potentially incriminating evidence by asking an assistant to destroy his cellphone and SIM card. In his statement Tuesday, Goodell said Brady did not disclose that the cellphone had been destroyed until "almost four months after the investigators had first sought electronic information from Brady." New England Patriots owner Robert Kraft said he now regrets his decision last May to accept the punishment handed down to the team in connection with the "deflategate" scandal. Kraft said he accepted a $1 million fine and the loss of a 2016 first-round draft pick and a fourth-round pick in 2017 because he believed it would "exonerate Tom Brady." "I was wrong to put my faith in the league," Kraft said during a press conference. Kraft said he has been "extremely" frustrated by how the league has handled this investigation, and he has issues with a head office that is "more intent on proving that they were right" more than proving the facts of the case. Kraft says the league has "no hard evidence" that Brady did anything wrong and that Brady has his "unconditional support."